Rene Becker with his wife, Cynthia, and their daughter, Lucie. Rene Becker grew up in Michigan and got his culinary start selling bread to the now-famous Zingerman’s Deli in Ann Arbor. In Boston, he was the restaurant critic for Boston magazine before becoming a baker at Lydia Shire’s Pignoli. 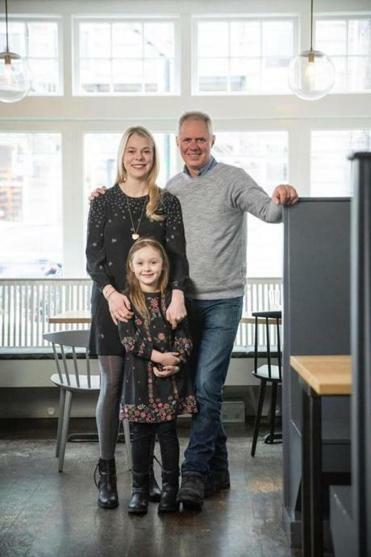 He opened Hi-Rise Bread Company in Cambridge in 1996, and last week, he opened Luce between Porter and Harvard squares. The sophisticated yet neighborly Italian restaurant replaces Shepard, his first venture in that space — a vaunted location that was once Chez Henri — and is named for his young daughter, Lucie. What’s the first restaurant you ever ate at in Boston? I think the first restaurant was Durgin-Park. I remember the beans, for sure. I wanted to have the true Boston experience. I went with a friend, and her parents took us. They wanted me to experience Boston, the true Boston. They warned me about the surly servers, but I found them to be really pretty warm-hearted. What’s one thing you’d like to fix about the restaurant industry here? It may sound cliché, but better pay for cooks and kitchen workers. It really seems like a very inequitable system, and it’s a tough nut to crack. I’ve seen restaurants in New York that have tried the no-tip approach, and it has failed, for most places. I wish there were a way to pay the people who are back there cooking our food more money. They get more money than they have in the past, thanks to minimum wages and sheer demand for talent in the kitchen, but it’s still a tough one. What other restaurants do you visit? Cynthia [his wife], Lucie, and I like to go to neighborhood-y places. It could be Frank’s Steakhouse on Mass Ave. or Greg’s in Watertown. Simple, fun, easy. We go to Kirkland Tap and Trotter often, most often, and Tony [Maws] just does a great job. We also go to Asta. Alex [Crabb] is like Tony. He’s one of the few people, I think, who understands what he’s doing when he composes a dish. It’s not as easy to make it simple yet so complex at the same time. And one of my all-time favorites is Chilli Garden in Medford. What’s your earliest food memory that made you think: I want to work in restaurants? I grew up in Detroit, with a lot of great bakeries, German or Polish. We still made bread at home. My mom’s dad was a baker. She taught me how to knead dough, how to form the balls, two at one time, and I just always loved the whole process of making bread. It was so fascinating to take four ingredients and do something different with them by altering fermentation times. In college, I convinced Zingerman’s to buy my bread one day a week. So on Fridays I’d go to my mom’s house with my starters and flour, and ultimately I got up to 120 loaves of bread. This paid my rent for a couple of years. What’s the worst restaurant experience you’ve ever had? I would say the worst was at a restaurant — a fancy one that still exists so I won’t use the name — in Boston. I was on a date, and I gave the server a credit card. He came back and said it had been declined. He went away and five minutes later came back with the manager. The manager said that the credit card company had told them to confiscate the card. Which was crazy! Fortunately, I had enough money in my pocket to pay the bill. After I left, I called the credit card company. They said they’d confiscated it because they feared fraud. The card had been swiped 25 times. Picture the server swiping, swiping, swiping! Fortunately, my date took it in stride. But it was embarrassing for her. People started looking at us. How could Boston become a better food city? I’d love to see a German or Austrian restaurant. And we spend a lot of time in West Texas, and we love real Texas barbecue. That would be fun to see. But I think the thing that would make this town better, much better, would be more New England-based restaurants. Simple places, like Jimmy’s Harborside or even Anthony’s Pier 4. Why don’t we have more seafood-based restaurants that just do simple preparations? That’s what people want. Name three adjectives for Boston diners. Worldly, smart, and discerning. What’s the most overdone trend right now? An excessive use of Asian seasonings and over-fermented foods. What are you reading? “Sabriel,” a young adult novel by Garth Nix. I’d been waiting eight years to read this book to Lucie. It’s all about magic. It may be too scary for her. We’ll see. I love it, and I think she will, too. So far so good. And for myself, Peter Liem’s tome on champagne, which is just . . . I love champagne, which is why we have such an extensive list at Luce. How’s your commute? I live, literally, across from Hi-Rise on Concord Ave. It’s a long 40-second walk to work. It’s like having an additional pantry. I can grab lemons when I need them. But when a baker forgets his or her key at 3:30 in the morning, I get the knock on the door. What’s the one food you never want to eat again? Andouillettes. What kind of restaurant is Boston missing right now? I think what’s really missing is simple neighborhood restaurants. Which is why I wanted to open Luce. What’s your most missed Boston restaurant? This is the easiest question you could ask me. The best restaurant I ever ate at in Boston is The Colony. Two guys, Bruce Frankel and David Kantrowitz, who studied with Madeleine Kamman, and it was located in probably the most famous restaurant spot in Boston. The food was unbelievable. So delicious. And, by the way, it was based on everything New England, hence the name The Colony. Corn fritters were fantastic. I still dream about them. So amazing. And their duck preparation! The funny thing is that they roasted the whole duck and only served half to the customer. If they didn’t serve the other half in a half-hour, it went into some other preparation. That gives you an idea of the intensity of that kitchen. Who was your most memorable customer? Cambridge is loaded with memorable people, but I have to say the person who gave me the greatest satisfaction was always Julia Child. To look up and see her standing in line with everyone else at the counter waiting to order was a real thrill for me. The last time I saw Julia, I delivered two roasted chickens and a lemon merengue pie to her house. She was just always very sweet to me. If you had to eat your last meal in Boston, what would it be? It might very well be Chilli Garden. I would start with cilantro green pepper salad, which if you haven’t had, you’ve got to try. It’s absolutely delicious. And the Sichuan-style dumplings, pork belly with leeks, chicken with three chilies, and lamb cumin.